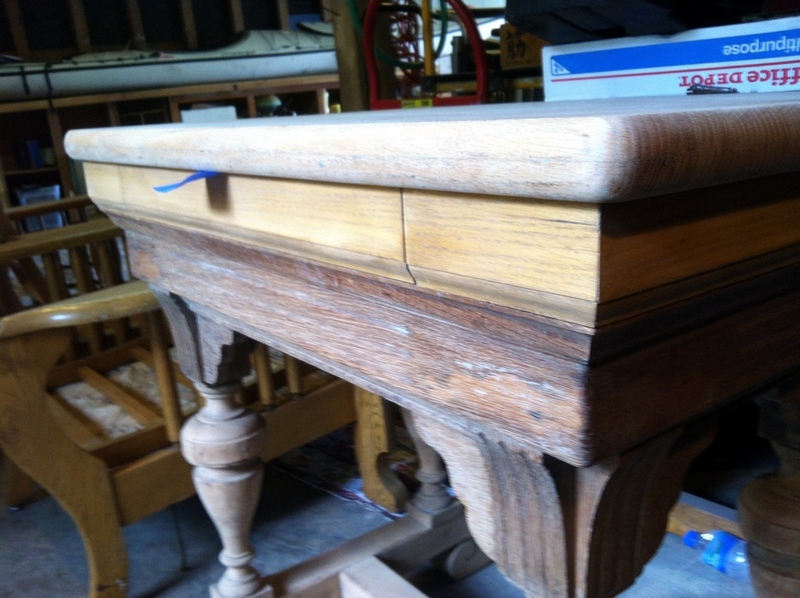 Not my piece strictly speaking, this is a pretty cool old table in oak that belonged to an old boss of mine. In addition to a refinish he wanted to remove the top, and add a tier with a short drawer for silverware, all on the cheap. Never tried an alteration before but it sounded like a fun challenge so I said sure. Turned out pretty well, we both thought, except my estimate was way off. Whoops. Here's the table in its original form, less a few coats of lacquer. As is so often the case, adding a few inches of height and a drawer turned out to be a lot more complicated than it sounded. This is what the insides ended up looking like. To save milling time we used stock oak moulding from the local big box depot. In varying states of finished-ness you can see we had a handful of different colors going on. I offered to take a crack at staining it even, but I was already so many hours deep in this thing the boss opted to do it himself.